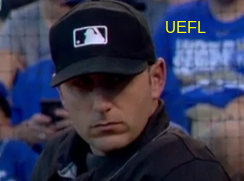 HP Umpire Pat Hoberg ejected White Sox Pitching Coach Don Cooper for arguing a ball three call in the bottom of the 1st inning of the Royals-White Sox game. With none out and none on, Royals batter Paulo Orlando took a 2-2 fastball from White Sox pitcher Jose Quintana for a called third ball. Replays indicate the pitch was located off the inner edge of home plate and thigh high (px -.998, pz 2.454), that the ball two pitch was located over the inner edge of home plate and above the midpoint (px -.772, pz 3.515 [sz_top 3.500]), and that ball one was located off the plate (px 1.311), the call was correct. At the time of the ejection, the game was tied, 0-0. This is Pat Hoberg (31)'s third ejection of the 2016 MLB regular season. Pat Hoberg now has 11 points in the UEFL Standings (6 Previous + 3 AAA + 2 Correct Call = 11). Crew Chief Mike Everitt now has 9 points in Crew Division (8 Previous + 1 Correct Call = 9). This is the 130th ejection report of the 2016 regular season. This is Chicago's 7th ejection, 1st in the AL Central (CWS 7; CLE, DET, KC, MIN 5). This is Don Cooper's 2nd ejection of 2016, 1st since June 24 (Angel Hernandez; QOC = Y [Balk]). This is Pat Hoberg's first ejection since July 27, 2016 (Larry Bowa; QOC = N [Balls/Strikes]). Wrap: Chicago White Sox vs. Kansas City Royals, 8/10/16 | Video available via "Read more"